As you may have guess, I've been on a paratrooper kick the past few months, pulling together figures for a couple new dioramas. I've got reviews of the first two airborne sets from Nemrod, and the three recent sets from Verlinden. Addition of 1/35 Construction Battalion from VLS, product updates for Skybow, AFV Club, and Italeri, and status update on YANKS orders. Summer's too short! We're back with two helpful contributions for Sherman builders: Kurt Laughlin provides visual evidence of the sloped sides of the M4A1 hull that will relieve modelers of having to make unnecessary corrections to the Italeri hull. And Scott Taylor provides some revealing interior photos of the typical Sherman driver and co-driver positions. Product list updates for Verlinden, Tiger Model Designs, and Masters Production. I've decided to take these two months off, since I've been working fairly consistently on this site for well over a year now. I'm going to focus on developing some new content and finish my 155mm howitzer diorama. Stay tuned! We're airborne again with reviews of five nice resin paratroopers from Warriors and Nemrod, and the original "Band of Brothers" from Italeri. A set of photos of the Howitzer Motor Carriage M8 from Mike Bedard joins the AFV Photos page. In the Sherman Corner, we have an article on improving Tamiya's mongrel M4 Sherman, and some good photo resources of turrets from Kurt Laughlin. Two new manufacturers, Masters and Platoon, join the Kits and Review section, and there's an update on Verlinden figures. The Sherman Corner features a new "tips and tweaks" article on Tamiya's M4A3 Sherman, which still holds up quite well in spite of its age. Many of the tips also apply to the company's recent late production and 105mm howitzer Shermans. New reviews of some excellent figures from Nemrod and Hobby Fan. Updated the Skybow page with some unsettling news. Over 3500 visitors logged onto the site last month, not bad for a "non-German" website. If you visited the last couple days of April, you might have noticed we exceeded our bandwidth. That's been boosted up a bit now for your viewing pleasure. Are you using the best available ration cartons on your AFV's? How do you sort through the various products available? Right here, with the comprehensive and instructive U.S. Army Field Rations. Bon apetit! With Calibre 35's new release of a maintenance truck conversion set for Tamiya's GMC Cargo Truck, these photos of Ordnance Maintenance Trucks from Michael Powell and technical manual images will help modelers looking to add details and create some imaginative maintenance dioramas. 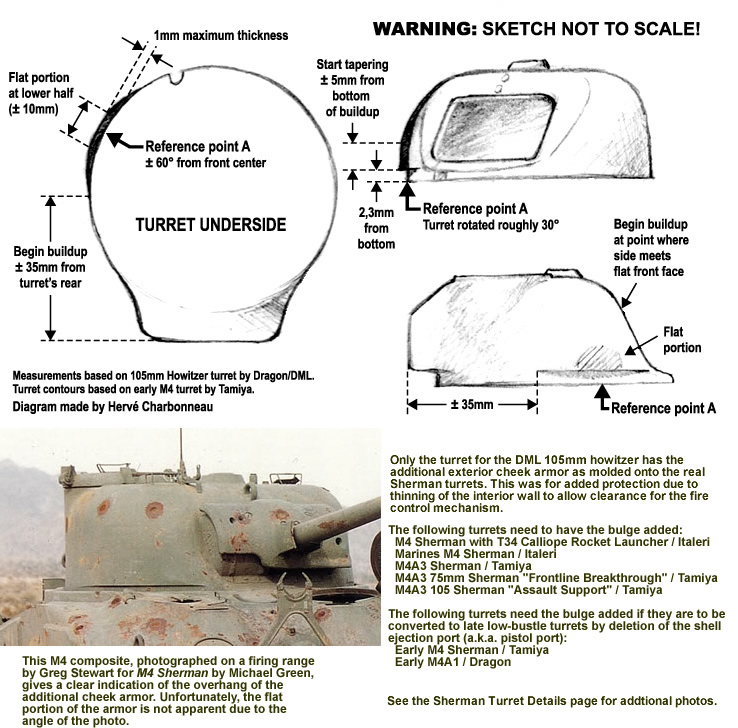 First additions to the new "Sherman Corner" in the Articles section: A "tips and tweaks" review of Italeri's venerable M4A1 Sherman that outlines the fixes for making this kit more accurate; Hervé Charbonneau's helpful diagram for Correcting the M4A3 Turret; and an article by Mike Canaday on "Correcting Tamiya's M4A3 Exhaust Deflector." My goal for the "Sherman Corner" is to bring together in one central depository information that will help modelers build up their Shermans to their personal level of accomplishment. And to help crew your Sherman, reviews of two fine figures from Royal Model. Updated DML, Warriors and Italeri listings, and began coverage of Lincoln County Line. Curahee! Added reviews of three Nemrod and two SOL paratrooper sets, as well as the granddaddy of airborne figures from DML. Added four new books to my recommended references: U.S. Paratrooper 1941-45 (Smith) and The GI in Combat, Northwestern Europe 1944-45 (Zaloga) on the Figure References page; and The M4 Sherman at War 2 and U.S. Armored Artillery in World War II, both by Steve Zaloga, in the Vehicle References section. Updated new figures from Verlinden (through June, 2003) and Warriors. Updated DML's list with newly announced U.S Support Weapons Team figures and M4A2 Sherman (Okinawa). Check the page for Ron Volstad's sketch of the new figures! January, 2003 - Happy New Year! Added reviews for three new YANKS figures and one Firestorm figure. Added Michael Roberts Ltd. resin figures to Kits and Reviews page. Updated product lists for Academy, Verlinden, and Warriors. Added "Between Life and Death in the Hurtgen Forest" diorama. Beta testing of the site.